Last week in the workplace: Of note, three fatalities related to forklifts. Also, while OSHA removes workplace fatalities from its homepage and buries them on their website without victims’ names, you’ll continue to find them here. Union Bridge, MD — A 32-year-old Union Bridge man died as the result of an agricultural accident Friday, police said. The incident occurred at approximately 7 p.m. in the 100 block of Pipe Creek Road in Union Bridge, according to the Carroll County Sheriff’s Office. Augusta, GA — A workplace accident that killed a man at Hoover Treated Wood in Thomson is being investigated by the Georgia Bureau of Investigation and other authorities. Deputy McDuffie County Coroner Paul Johnson confirmed the death of 58-year-old Johnny Bradshaw of Dearing, Ga. The accident happened about 3:30 p.m. at the treated wood facility on Wire Road. Conway, SC — The last time two employees were killed in the U.S. during a bank robbery was in 2014, according to FBI statistics. That makes last week’s Conway CresCom bank heist, when two female employees were shot to death, one of the nation’s deadliest in recent years. Authorities say 32-year-old Brandon Michael Council, of Wilson, N.C., shot and killed Kathryn “Katie” Davis Skeen, 36, of Green Sea and Donna Major, 59, of Conway during the robbery on August 21 before fleeing the scene in one of the victim’s vehicles. There were 4,251 bank robberies that took place across the country in 2016 and only one employee was killed, the statistics show. KINGSTON, Ark. — A member of the Kingston Rural Volunteer Fire Department suffered a medical emergency while responding to a call, and later died from the injury, according to the Lowell Fire Department. Randy Treat was a firefighter with the Kingston Fire Department as well as a retired battalion chief from the Springdale Fire Department. Treat became unresponsive while responding to a call, which led to the fatality, according to the Lowell Fire Department. East Allen, PA — A 32-year-old Allentown man died Thursday after he was injured in a forklift accident at the Trader Joe’s warehouse near Bath. Miguel A. Amonte was driving the machine when he struck a steel post 12:21 p.m. Thursday at the warehouse, 6835 Silver Crest Road in East Allen Township, the Lehigh County Coroner’s Office said Friday in a news release. The facility is also called World Class Distribution. Charleston, SC — A fired dishwasher shot and killed a chef and held a person hostage for about three hours before he was shot by police at a crowded restaurant in a tourist-heavy area of downtown Charleston on Thursday, authorities and one of the restaurant’s owners said. The hostage was freed unharmed, Mayor John Tecklenburg said. The gunman killed Virginia’s executive chef, 37-year-old Anthony Shane Whiddon, deputy Charleston County coroner Sheila Williams said late Thursday. WASHINGTON, DC – Community members are in shock after a construction worker was shot and killed on the job Wednesday. It happened in broad daylight just after 1:45 p.m. Metropolitan Police say someone shot and killed 34-year-old Balmore Mauricio Fuentes of Dundalk, Md. Fuentes was the crew chief for a construction company, overseeing the reconstruction of several houses in the Trinidad neighborhood in Northeast. Fuentes’ boss and other area contractors say Latino construction workers are often targeted on the job because people believe they are carrying cash, which is not the case most of the time. Pickens, WV — A coal miner with ties to an mining disaster a decade ago was killed Friday at a mine near the Upshur-Randolph County border, according to state and federal officials. Owen Mark Jones, 51, of Pickens, was fatally injured shortly after 2 p.m. at Carter Roag Coal Company’s Pleasant Hill Mine near Mill Creek, according to a news release from the company, which is owned by Metinvest, a mining and metals firm headquartered in Ukraine. On Jan. 2, 2006, an explosion ripped through the Sago Mine in Upshur County, not far from Mill Creek. Twelve miners died, including Owen Jones’ brother, Jesse. In an interview after the Sago disaster, Owen Jones recalled his experience as one of the miners who tried to reach the men — including his brother — who were trapped by the Sago explosion. Only one of the trapped miners survived. “It was like watching your brother falling off a cliff and not being able to do anything about it,” Owen Jones said at the time. FORT WORTH, TX — A construction worker was killed Friday afternoon when a steel beam fell on him at a job site in far north Fort Worth, MedStar spokesman Matt Zavadsky said. The man has not yet been identified. POMPANO BEACH, FLA. (WSVN) – A construction worker was killed after, officials said, he was struck by a concrete wall that came down at a home under construction in Pompano Beach, Friday afternoon. Broward Sherifff’s Fire Rescue responded to the scene of the accident along Southeast 14th Street, near 22nd Avenue. Officials said the 47-year-old victim was building the home when the wall fell on him. Milton Township, OH — When a tire blew on his tractor-trailer Tuesday afternoon on an Ohio highway, Stephen Garceau did just what he should have done. He pulled the rig and its oversized load well off Interstate 71 northbound in Milton Township, the Ohio State Highway Patrol said, and placed safety triangles on the berm behind it. But as the Champlain man, 44, and Dennis E. McKenzie Jr., from Love’s Travel Stop, were working on the truck, Paul A. Cory of Akron lost control of his Toyota Camry, crossed the rumble strip on the shoulder of the road. “He fell asleep and killed them both,” Garceau’s sister, Linda Bond, said Friday. Greeley, CO — A 44-year-old Milliken man died Thursday night when the forklift he was operating rolled into a retention pond. The workplace accident happened about 8 p.m. at an outdoor A&W Water Co. facility about 12 miles northeast of Greeley near Weld County roads 61 and 64. Marion Keith Sparks was taken by medical helicopter to North Colorado Medical Center, where he was pronounced dead at about 9:15 p.m., according to a Weld County Coroner’s Office news release issued Friday. Natchez, MS — Official released information Thursday about how a construction worker found dead on a Mississippi bridge died. A report from Adams County Coroner James E. Lee identified the man as Alexander O. Flores, 30, a resident of Morton. The report suggests that heat exhaustion is the likely cause of death. Washington DC — A construction worker died Thursday in D.C. after an eight-story fall at a work site, authorities said. Around 2:15 p.m., officers responded to the unit block of N Street NE for a report that a worker had fallen at a construction site, according to a D.C. police spokeswoman. 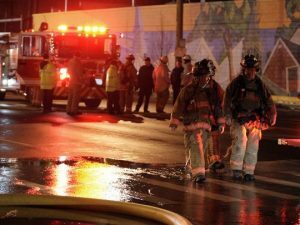 The worker was pronounced dead at the scene after falling from the 10th floor of the site to the second floor, a spokesman for the D.C. fire department said. The victim was identified by police as 45-year-old Jose Rivera of Germantown. LOUISVILLE, Ky. (WDRB) — A firefighter died in the line of duty in Campbellsburg, Kentucky. Thomas McBride, 60, died of an apparent heart attack, officials said.. He was participating in search and rescue training around 9 p.m. Thursday when he complained of breathing problems. McBride refused medical treatment and requested to return to training when he felt better. Instead, he was assigned to pump operations. He collapsed a short time later and died at the hospital. PALM HARBOR, FL – Deputies are investigating a work-related accident after a tractor rolled over on a man in Palm Harbor, the Pinellas County Sheriff’s Office said. Steven R. Brakenwagen, 26, of O’Brien, an unincorporated community in Suwannee County, died at the scene. Mr. Brakenwagen and his co-worker, Levi McFatter, 26, had been taking turns driving a Kubota tractor and spraying vegetation in the power line easement. Both were employed by Natur Chem, which had been contracted by Duke Energy to spray the vegetation on the Duke Energy property. McFatter was taking a break while Mr. Brakenwagen was driving the tractor in a wooded area. When Mr. Brakenwagen did not return, McFatter went to check on him and found the Kubota tractor overturned in a deep hole, with Mr. Brakenwagen trapped underneath and unresponsive. Deputies said McFatter called 911 and paramedics from Palm Harbor Fire Rescue responded. WEST HAVEN, Conn. (AP) — Police say a construction worker has died after being hit by a car in Connecticut as she tried to slow traffic while a co-worker attempted to maneuver their disabled vehicle. West Haven police said Thursday that 24-year-old Jordan Garrett, of Moosup, died of injuries suffered in the Wednesday night crash. Police say she was hit by an oncoming car while trying to get vehicles to slow or stop. Macon, GA — A man is dead after a shooting Wednesday night at a Macon restaurant. Jian Fang Wang, 38, an employee at Hot Wings Plus, 3479 Pio Nono Ave., was leaving the restaurant with two other employees at about 10:15 p.m., according to the Bibb County Sheriff’s Office. As the employees reached their cars, a man emerged from behind the store, approached Wang’s car and shot inside the vehicle several times, according to Bibb County Sheriff’s Lt. Randy Gonzales. The shooter then took a bag believed to contain money from the business, Gonzales said. The robber then left in a vehicle. And on Tuesday night, Bibb County Sheriff’s Office responded to a shooting at the L&C Convenient Store on Hillcrest Blvd. According to Lieutenant Gonzalez, when deputies arrived at the store, they found a man suffering from multiple gunshot wounds, and the cash register was open and emptied out. Chief deputy coroner Lonnie Miley says the man was 42-year-old Brijeshkumar Patel, who also passed away from his injuries. Franklin, OH — The Lebanon man killed in an industrial accident Tuesday died from multiple blunt force trauma, according to the Warren County Coroner’s Office. His death was ruled an accident. Doyle Burke, chief investigator for the coroner’s office, said Douglas Mescher, 30, of Lebanon, was killed Tuesday when he was struck by machinery that weighs 26 tons. Tthe load he was under slid off the forks of a forklift and crushed him, said, Scott Allen, U.S. Department of Labor, Regional Director for Public Affairs. BEL AIR, CA — A worker died Thursday at a construction site in the Bel Air Estates area. Firefighters were sent to the 800 block of North Stradella Road at about 12:20 p.m. on a report of a “significant medical emergency” about 300 feet down a graded hillside, the Los Angeles Fire Department reported. The 56-year-old man was pronounced dead at the scene. His name was withheld, pending notification of his relatives. HOPEWELL TOWNSHIP, TX – A Bedford County man died in a farming accident Tuesday afternoon. Charles W. Clapper, 59, of New Enterprise, was pronounced dead at 2:04 p.m. at the scene of the accident by Bedford County Coroner Russell Styer. The accident took place on Halls Hill Road in Hopewell Township. Styer said Clapper died of multiple crushing injuries to the torso. According to dispatch, a piece of a machinery rolled over onto him. Tonapah, NV — The Nevada Occupational Safety and Health Administration is investigating the death of a contractor worker outside of Crescent Dunes Solar Energy Project in Tonopah. The victim was identified by officials as Brandon Carpowich of Henderson. “Death was from an electrical accident that occurred while the employee was working on a personal project, unrelated to the solar facility,” said Mary Grikas, a spokeswoman for SolarReserve. The Nye County Sheriff’s Office initial investigation showed that it was an accidental death in the workplace, however the cause of the death will be determined by the Washoe County Regional Medical Examiner’s Office. Sherman, IL — A 28-year-old man was killed early Wednesday when his semi tractor-trailer struck a bridge support along Interstate 55 near Sherman, Illinois State Police said. Mariusz Bednarz of Bridgeview was pronounced dead at the scene following the 3:20 a.m. crash. An autopsy has been scheduled for Thursday morning, a press release from the Sangamon County Coroner’s Office said. Police reported that the northbound truck went off the roadway to the left, into the median. The truck then struck the bridge support. BRIDGEPORT, Conn. — A 47-year-old Bridgeport man died after a tow motor he was using to deliver wood overturned onto him, according to the Valley Independent Sentinel. At 8:45 a.m. Saturday, Mazhar Khan was making a delivery in Ansonia as a subcontractor of Lowe’s when the accident occurred, the Valley Independent said. I do not know why it is so important to you to release the names of those killed in workplace accidents. My son is Douglas Mescher, the Lebanon, Ohio man, who was killed by a 26 ton piece of machinery. He was a husband, a son, a brother, a grandson, an uncle, a brother-in-law, a son-on-law, a cousin, a nephew, and a friend. When your child dies it is unbearable but the media and social media has made that pain all even greater. It is sad that the family is not considered. I’m so sorry for your loss Ms. Peters. Thanks for your note Most of the people I talk to who have lost loved ones in the workplace appreciate some recognition of their loss, hoping that some recognition of what happened will help keep similar tragedies from happening to others. Many of them have joined together to try to strengthen OSHA and the laws that protect workers from hazards in the workplace. The name of the employer is what is most important. Any employer who has murdered an employee via trenching, confined space, falls from elevations, lockout/tagout, etc. should be prosecuted to the fullest. In this day and age, there is no excuse for such deaths.